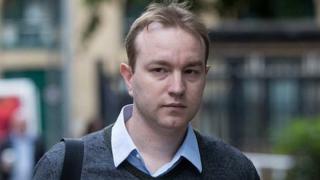 Image caption Tom Hayes denied that what he was doing was "clandestine"
A trader accused of manipulating the Libor rate has told a court that senior managers knew what he was doing. Tom Hayes is the first trader to be tried by a jury for his part in the manipulation of the key interest rate. "I acted with complete transparency... My managers knew, my manager's manager knew. In some cases the CEO [chief executive] was aware of it," he said. The former UBS and Citigroup trader denies eight counts of conspiracy to defraud over the period 2006-2010. Mr Hayes denied that what he was doing was "clandestine" and said that he made no attempts to "cover his tracks". The 35-year-old said that he did not believe that at the time that what he was doing as a Libor trader was "wrong". He said he was motivated by his determination to make as much money as possible for his bank. "Greed was the wrong word, hunger is a better word. "I was hungry to do the best job I could do - because of the performance metric, because that is how you are judged," he told the jury at Southwark Crown Court. Mr Hayes also said that others bankers at UBS seemed to be fixing the Libor rate for commercial gain before he arrived at the bank. He said that a group of senior managers at UBS discussed manipulating the Libor rate and that "nobody batted an eye lid". He said he had calculated that he had made $300m for UBS over three years and that the bank had not paid him what he felt he was owed for his success. He said that very little of his profit for the bank actually came from Libor trading. During his time at Citi Bank in August 2010, Mr Hayes was called into meeting with lawyers who were looking into the Libor market. Mr Hayes said that he could not work out what he rules he might have broken. Mr Hayes also told the court that he gave interviews to the Serious Fraud Office in 2013 cataloguing his actions as a Libor trader in order to prevent him being extradited to the US where he was being charged by the Department of Justice. He said that he was "frozen with fear" and "petrified" when he learned that he was to be charged by the US Authorities. Mr Hayes's trading activities were based around movements in the Libor rate - an interest rate used by banks around the world to set the price of financial products worth trillions of pounds.